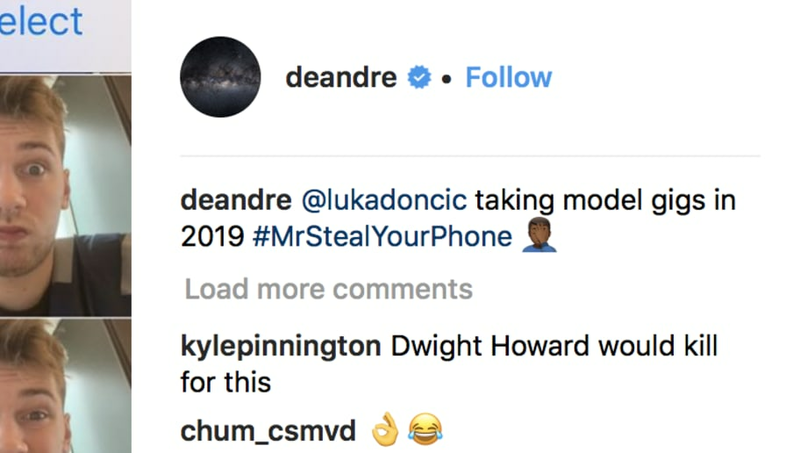 Everyone knows that you don't leave your phone with one of your friends alone-- except for DeAndre Jordan, apparently. Mavericks teammate Luka Doncic was not going to let his opportunity escape him, booting up DJ's Instagram and getting a bit mischievous. The talented rookie posted an extended string on selfies on Jordan's IG, another stellar performance in what is already a terrific 2018-19 campaign for him. As Doncic commented on the post, "who is that pretty guy tho?" The photos that he posted last night are still up on DeAndre's account, suggesting that they really are here to stay. The Dallas Mavericks star has been playing lights out recently. Doncic recorded 32 points on Thursday against the Los Angeles Clippers. He's been putting up numbers that even mirror Lebron James at the start of his career. Doncic's success on the court in the NBA has not stopped him from being a kid, though. At only 19 years old, it's clear that he still enjoys pulling silly pranks on his teammates. And at this rate, nobody ought to try to stop him.